The Finger Lakes region of Upstate New York is a perfect destination for your group's next trip. Our area originally became popular with the motorcoach market because we are located between top destinations such as Niagara Falls and New York City, New England and the Mid-West, Pennsylvania Dutch Country and Canada. Our region is well suited to the smaller, high-end groups that are looking for wonderful lodging and customized experiences. There are also many properties that welcome the value-oriented guest and all provide the friendly staff and welcoming atmosphere we are known for. 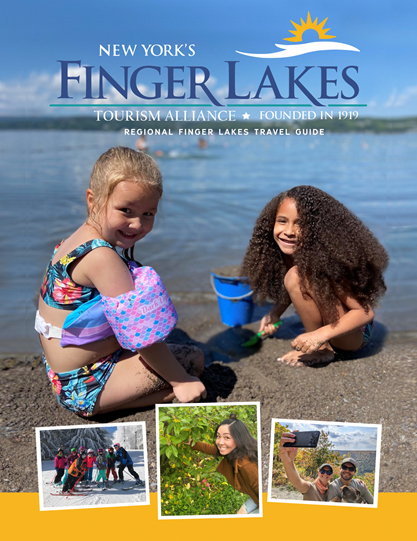 We have receptive operators, step-on guides and motorcoach companies ready to help you with logistics, and Finger Lakes Tourism Alliance has all the information you might need to start planning a trip. Top Finger Lakes attractions include The Corning Museum of Glass, Watkins Glen International Raceway, National Soaring Museum and the George Eastman Museum. Unique shopping venues such as the Windmill Farm & Craft Market, Waterloo Premium Outlets and the Ithaca Downtown Commons are always ready to welcome your customers. The Finger Lakes is home to over one hundred wineries; stop at one or develop an entire itinerary based on the wineries. The majority of wineries are situated around our lakes, which make for gorgeous views while you taste the Rieslings, ice wines and many red wines our region is known for. If your group is into authentic foods, the New York Wine and Culinary Center has cooking demonstrations and hands-on classes featuring New York foods. Finger Lakes Culinary Bounty is an organization that promotes local foods and many of our group friendly restaurants are members. Step on guides and receptive operators are available in the Finger Lakes region to make itinerary planning, routing and gathering local information and tips a complete breeze! Consider contacting Experience! The Finger Lakes, Grapevine Country Tours, Finger Lakes Hospitality, Hayfield Quality Tours for help with pre-planning and step on services. Looking for stand out great group friendly events? Visit one of these TWO American Bus Association Top 100 Events. The Finger Lakes Wine Festival in Watkins Glen or GlassFest in Corning are two incredibly fun and group friendly events that showcase the best of what the Finger Lakes has to offer! Sample itineraries? Check out our Group Tour Planner, available as downloadable PDF's. Our job is to help you be a success and to keep your customers returning to the Finger Lakes region.Thanks for considering the Finger Lakes!